The Swedes are pretty early risers, which is admirable given that, for much of the year, they will wake up, have breakfast and go to work in complete darkness. The only way to get through such dispiriting winter mornings is to wrap up (“there’s no such thing as bad weather – only bad clothing”, as my mormor (granny) always says); and to fuel up: a good breakfast is essential. 1 Set the oven to 200C/400F/gas 6 and line two baking sheets with parchment. Combine all the ingredients, except the dates and yoghurt, in a large bowl with a pinch of salt and stir well, dispersing everything evenly. 2 Divide the granola between the baking sheets and bake for 10 minutes. Toss the ingredients a bit and swap oven shelves. 3 Continue to toast for a further 5‑10 minutes, or until golden and crisping up slightly. Allow to cool completely before adding the dates and transferring to an airtight container. 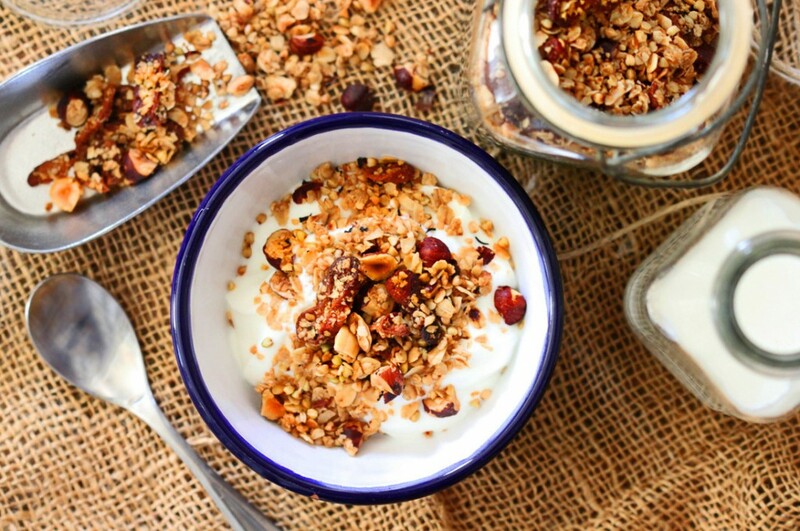 The granola will last for up to a month in a cool place. 4 Serve with yoghurt and berries, such as blueberries and blackberries. 1 Crumble the yeast into the honey, add 1 tsp salt, then mix until the yeast dissolves. Add 600ml lukewarm water and mix thoroughly. Add the flours and mix into a sticky dough, but don’t knead. Cover the bowl with a tea towel and allow to rise for about an hour. 2 Meanwhile, make the jam. Put a saucer in the freezer. Combine the cherries, lemon juice and vanilla pod in a small saucepan with 1 tbsp sugar. Bring to a gentle simmer and stir until the sugar dissolves. Add another spoonful of sugar and repeat, continuing until it has all been added. Simmer for 20–30 minutes, or until jammy. Take the saucer from the freezer. Place 1 tsp of the jam on to it and leave for 1 minute or so to cool completely. Push a finger across the jam. If it wrinkles, the jam is ready Otherwise, cook it for a bit longer. Once done, pour into a sterilised jar. 3 Set the oven to 220C/425F/gas 7 and lightly grease 2 baking sheets. Flatten the dough on a floured work surface – sprinkle with plenty of flour to make it easier to handle. Divide the dough into 8 pieces. Shape into about 8-10cm rounds. Transfer on to the prepared baking sheets, spacing out evenly. 4 Sprinkle over a little extra flour, then bake for 17–19 minutes, or until risen and golden. Allow to cool a little before getting stuck in, slathering with jam. 1 First, make the curd. Beat the butter until creamy, then add the sugar and mix until light and fluffy. Gradually add the beaten eggs to the sugar and butter, beating constantly. Fold in the grapefruit juice, zest and peppercorns. The mixture may split, but don’t worry, it will come together in the pan. 2 Pour the curd into a medium, heavy-based saucepan and cook over a low heat, stirring constantly. As the mixture thickens, you can increase the heat a little until it coats the back of a spoon without dripping off (or reaches about 75C/167F, if you have a sugar thermometer). Pour into a sterilised jar and allow to cool completely. 3 Set the oven to 180C/350F/gas 4. Line two six-hole muffin tins. Whisk the buttermilk with the vanilla and cooled melted butter in a jug. In a bowl, combine the flour, sugar, baking powder and bicarbonate of soda with a pinch of salt. Make a well in the centre then add the buttermilk mixture. Mix into a sticky dough; do not overmix. 4 Divide between the muffin cases. Bake for 20–25 minutes, or until risen and golden. Allow to cool slightly before turning out of the tin and serving with the curd. STEFFI KNOWLES-DELLNER is the author of Lagom: The Swedish Art of Eating Harmoniously. She is also a food stylist and contributor to The Guardian. I’ve been trying to learn & follow more blogs focused on Scandinavian food. So I loved reading this!